Hundreds of trophies from years of motocross racing covered every inch of senior Brandon Zohlen’s bedroom floor. Like a museum, plaques and photographs hung on the walls to commemorate each one of his big wins. Motocross was his whole life and he showed that through the decor of his bedroom. Brandon fell in love with motocross when he got his first bike at the young age of 6. Zohlen’s father grew up wanting to do motocross, but was never allowed to pursue it. This inspired him to introduce Brandon to competitive racing when he was 8 years old. Since then, Brandon’s every waking moment had been dedicated to working out, practicing weekly and improving his skills. He attended his first race at Soaring Edge Motocross Park in Lincoln. He got last place after being lapped by first place. Although he didn’t win, Zohlen’s passion for motocross sparked from this race. In the following year, he began practicing and building up his endurance so he could eventually take home a win. Within his first year of racing, he began to take the sport more seriously. Starting when he was in fourth grade, Brandon and his dad got up each morning at 5:30 A.M. to work out. Motocross not only requires you to be able to ride a bike, but also have a lot of athleticism and strength. The father-son duo drove to Lincoln three to four times a week during the riding season to perfect Zohlen’s riding technique. Paul was not only Brandon’s coach, but his mechanic, chauffeur and biggest supporter. The countless hours they spent together ultimately created a bond between the two that will never be broken. Starting at age 9, Brandon began to make a name himself. He had won almost every race he attended which got him attention not only from the motocross world, but from companies who wanted to sponsor him. They would offer him a discount on gear or bike parts if he would advertise the company on his bike. 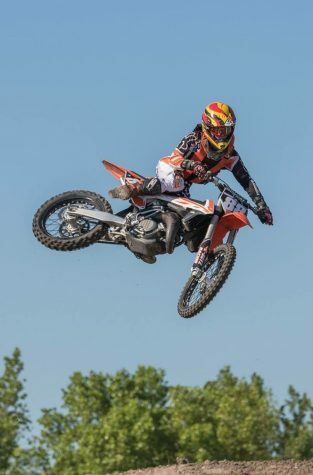 Brandon later became known as local hero in the motocross world. His fame came from winning five State Championships in three different states along with countless other races. When attending races, people would recognize him and want to get his autograph. Brandon was at the peak in of his career when tragedy struck. On Nov. 17th 2017 he was out on a routine practice when his left leg got caught between the wheel and the mud flap of his bike. He then wrecked his bike at the finish line and had to have assistants to untangle his leg from the bike. During the chaos he unfortunately tore his ACL which meant he would be unable to race for the rest of the 2017 season. A few weeks after the accident, Brandon had surgery to repair the injury. In the seven months following he endured physical therapy everyday to get his strength back. His friends and family showed nothing but support for him throughout the recovery process. After about five months off the bike, Brandon was finally allowed to get back to training. Although he had countless other injuries throughout his career, this one kept him from training the longest. At practice on July 31st, 2018 Brandon put his foot down while going around a turn when he felt a pop in his previously injured knee. He pushed through the pain and finished out the practice. Afterward he and his father did a few tests to assess the injury but didn’t know how serious it actually was. In the moment Brandon knew that was the end of his motocross career. Within a month, Brandon was put under the knife once again to repair the torn ligament. He would then start the recovery process and learning to live a normal life without motocross. Although Brandon is unable race competitively he still plans to continue supporting the community. Going to local races to see former competitors and once healed just riding for fun will keep Brandon’s love for motocross alive. His career may be over, but his legacy will live on forever.